It has been brought to my attention that I made what could only be described as a monumental error in the recipe for the pizza bases which I posted yesterday. There were 2 lines which were different quantities of olive oil – one line should have read ‘warm water’. This has now been corrected and I sincerely hope that no-one has made it from the original copy. Secondly, in response to a comment on the post I will explain a little about psyllium. Yes, it is a laxative but that is not the reason for using it in the pizza bases. As Monica Topliss, the author of the recipe book explains, it is the ‘secret ingredient’ in many of her gluten-free recipes as it provides the elasticity that is lacking with the absence of gluten. Using this theory I have managed to successfully make my own gluten-free pasta. Psyllium is also purported to assist in lowering cholesterol levels. Here in Australia it is readily available in supermarkets and health food shops. Tonight I want to share another dinner idea with you – risotto. In no way could this be described as a recipe but more of a method. Risotto is arborio rice cooked gently in a small amount of liquid. Keep adding liquid and stirring regularly unto the desired tenderness of the rice is reached. I use my large flat-bottomed wok to make risotto. Quantities for 2 adults (sometime there is enough left for 1 lunch). This will make the basic mixture to which you can add whatever you like. I used asparagus and sun-dried tomatoes. Fry the onion in a little oil. Add the rice and toss to coat thoroughly. Add some water and the stock powder. Simmer and stir until the water is almost absorbed and add a little more water. Continue to do this until the rice is cooked and almost creamy. I also added 2 teaspoons of powdered dried tomato with the water. Finally, I stirred through some sun-dried tomatoes and fresh asparagus cut into pieces and cooked for 1 minute in the microwave. Serve immediately with a little grated cheese if desired. Pumpkin and bacon, broccolini and capsicum (peppers) or sweet potato and caramelised onion are some other winning combinations. You can experiment with different flavours but I would advise only using 2 or at the very most 3 ingredients or otherwise the flavours become overwhelmed. The only thing I do not use in risotto is mushrooms – they turn the mix a fairly unappealing shade of grey! Although you can buy gluten-free pastry and it is possible to make it from scratch there is an easier option for the base of a quiche or savoury pie. Combine all ingredients, press mixture into a dish, chill for 30 – 60 minutes then add filling and proceed as for regular pastry case. Like pizza, quiche is great for using up small amounts of various ingredients for the fillings. The combinations are limited only by your imagination. Remember, that you do not need huge amounts of filling. Today, I used bacon, mushroom and broccolini. 1 rasher of bacon, 1 mushroom, 1/2 onion and about half of a small bunch of broccolini. Here it is chopped up and ready. I kept the stalks and florets of the broccolini separate. The onion is frozen as I have about 7 kgs of diced frozen onion in my freezer. You can read about it here. I sauteed the onion and bacon before adding the chopped stalks and finally the mushroom and florets of the broccolini. I allowed the mixture to cool for about 5 minutes before spreading over the base of the quiche. I then covered this with 1 cup and grated cheese. The final step is to make the custard, for that is essentially what a quiche is – savoury custard. I never follow a specific recipe for this but it is a mixture of milk and eggs. Carefully pour the egg mixture over the filling. Don’t worry if the egg mixture does not cover the cheese. It is best not to overfill the dish or you will find that it overflows during cooking. Bake at 180C for 35 – 40 minutes or until firm to touch and golden. The rice crust can be made using whatever rice you prefer. I use brown rice as it works equally as well as white. Make sure the rice is well-cooked to help it stick together. The filling can be any combination of whatever you choose. The custard mixture is milk and/or cream and eggs. I happened to have the cream as it was bought to have with dessert last week when we had guests. I generally do not have cream and tend to use skim milk powder blended with a smaller amount of water than normal to mimic evaporated milk. From memory, I think it is about 1 cup of milk powder to 1/2 cup of water. 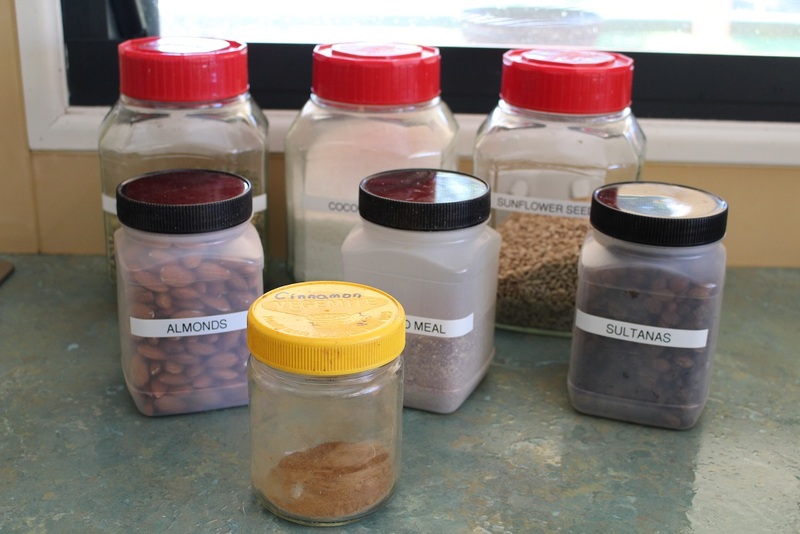 As many of you would be aware, I buy most of my dry goods from the bulk bins at Simply Good. This means I can buy as much or as little of an item as want with no packaging and no waste. This is a topic dear to my heart and one which is being encouraged during ‘Plastic-Free July’. I use re-usable mesh bags for things like dried fruit, seeds and nuts and reuse paper bags for flours and almond meal. Once I get home they are decanted into storage jars. 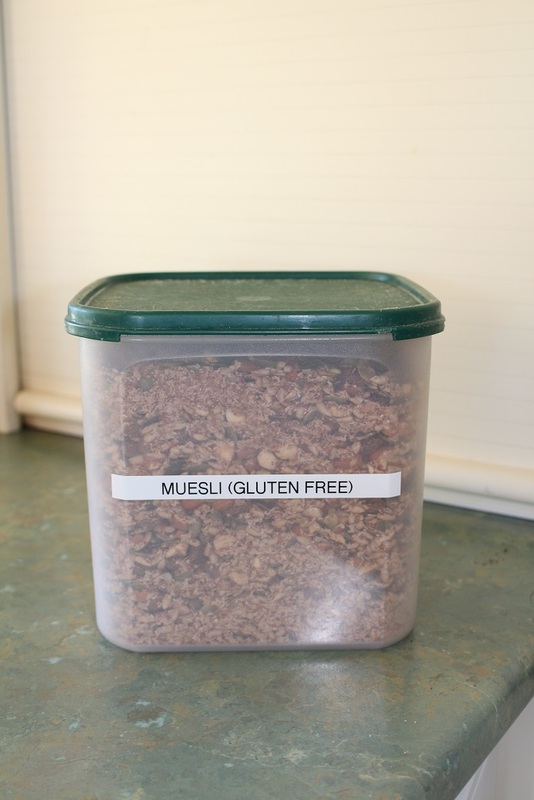 These are the ingredients I use to make my gluten-free muesli. You can adjust the quantities to suit yourself. I store my mix in a large airtight container. 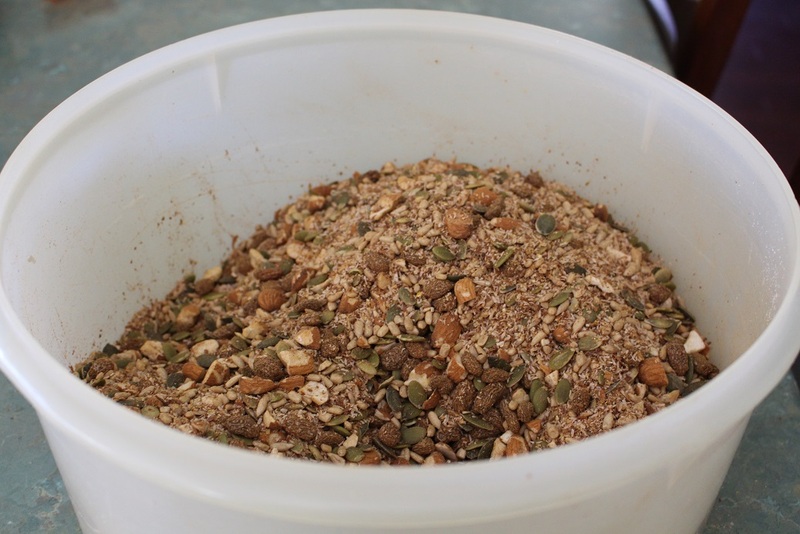 To serve – I use 1/4 cup of muesli and add 1 dessertspoon each of chia seeds and psyllium husk. I usually add 1 apple (grated) and 1 kiwifruit (chopped) plus a spoonful of plain yoghurt. It makes a delicious and satisfying breakfast.